－Our String Light is DIMMABLE. But the dimmer is not included, if you want it dimmable, you need to buy a dimmer yourself. 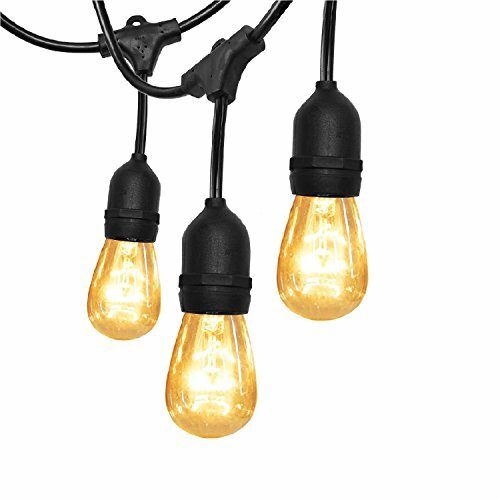 【BEST CHOICE FOR YOUR DECORATION】 This String Light emits warm and romantic yellow light, that perfectly decorate your backyard and patio, bring your family relaxed and happy atmosphere. 【UL CERTIFIED & PURE COPPER CRAFT】The Outdoors String Light is Commercial Grade UL Certified . The Sockets are using pure copper craft, fast conduction, low heat. Very safe for using. 【WEATHERPROOF】Our String Light is Waterproof, Snowproof, Windproof, Sunproof Heat-Resistant. Safty and Durable. 【IDEAL BULB SPACE & EXTENSION CORD】 2Ft bulb space makes the decoration more charming, which will not too bright nor too dark, brightness is most ideal. In particular, the string light is designed a Extension Cord of it two end, so that you can use it conveniently. 【WE WON'T LET YOU DOWN】We have the same quality as the famous brand,but ours is more value for money. If it's not satisfied you, 60 days changing or refunding without reasons is guaranteed! Choose us, we won't let you down! If you have any questions about this product by SUPERDANNY, contact us by completing and submitting the form below. If you are looking for a specif part number, please include it with your message.